In North Dakota, you can buy a car from a private seller or a dealer. When buying the car from a dealer, they will handle the required paperwork on your behalf. But when you buy it from a private seller, you will need to handle the required paperwork yourself. So, you need the required paperwork from the seller in order to get the car registered and titled with the North Dakota Division of Motor Vehicles (DMV). Continue reading this article to get more information about the paperwork required when buying a car in North Dakota. You must obtain vehicle registration and title receipt from the seller. If you are buying a vehicle from a dealer, they will process the required paperwork on your behalf. The title must be signed by all previous registered owners, and all signatures must be notarized. Obtain odometer reading from the seller if the vehicle is more than 10 years old. The reading can be recorded on the title or a separate document. Also obtain a bill of sale from the seller. The vehicle must not have active liens. Double-check that the vehicle identification number (VIN) on the vehicle matches the one entered on the title. If the vehicle is less than 9 years old, the seller must fill Form SFN 18609 (Damage/Salvage Disclosure Statement), even if there is no damage. A dated copy of the title. A dated Form SFN 2888 (Seller's Certificate and Vehicle Bill of Sale). You must submit this form to the NDDOT within 30 days. The vehicle title is needed when registering or titling the vehicle into your name. If the title is missing, you must apply for new one with the NDDOT. To do so, you must fill and complete Form SFN 2872 (Application for Certificate of Title & Registration of a Vehicle Form). Provide explanation of the existing title and enough information supporting your ownership claim. A new title will be issued to you if the submitted information is proven sufficient. 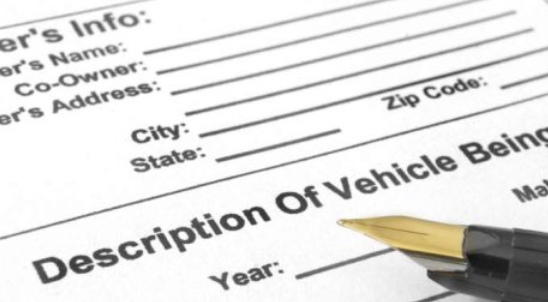 A Vehicle History Report is not required when registering and titling your car. However, this report is important for you since it provides useful information about a vehicle that you are buying. Some of the information in this report includes: past accidents, odometer estimate, damage from accidents, floods etc.